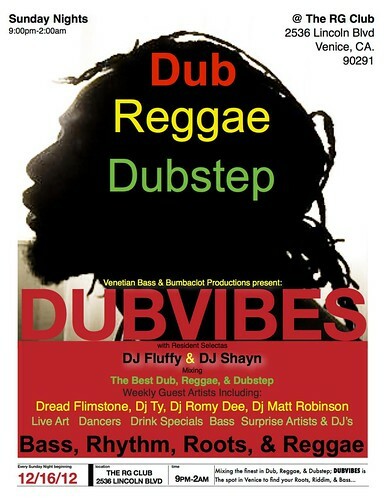 Reggae at the RG: DJ Fluffy + DJ Shayn! - Yo! Venice! Home Venice Beach California Reggae at the RG: DJ Fluffy + DJ Shayn! Reggae at the RG: DJ Fluffy + DJ Shayn! The newly remodeled RG Club on Lincoln will feature DJ Fluffy and DJ Shayn on Sunday nights starting this weekend! 9pm-2am! Dub, Reggae and Dubstep will be the tone for the evening. Guest artists will include Dread Flimstone, DJ Ty, DJ Romy Dee, DJ Matt Robinson and many surprise guests! Drink specials? Yup! Covered smoking porch? Yup! If you live in or near Venice, this is the place to be on Sunday evenings! The RG Club Sunday evening Reggae! 9pm-2am!